rebuild Picasa – Learn Picasa and Google Photos! Note: a more recent article on this topic can be found at Keep your People Named by Checking this Box. Q: If I re-install Picasa and delete the old database, what happens to all the face tagging? I have spent a lot of time getting my ~10,000 pictures or so all tagged with named faces. It appears to be rescanning. How can I get back my name tags? Quite some time ago, I wrote an article called, “Picasa Tip: When your pictures get “All Messed UP”. In it I wrote about the scary things that you see in Picasa when its database gets corrupted. This used to happen quite regularly. It doesn’t happen so much anymore, but there are still times you need to re-install Picasa and rebuild its database. And now, with face recognition there are more issues. In the article I detailed 2 procedures for fixing the corruption. 1. Delete the Picasa2 folder or 2. Open Picasa while holding down Alt/Ctrl/Shift. The Alt/Ctrl/Shift method has been removed – I’m not sure when. The delete the folder technique still works, but it is not the officially recognized method for dealing with the problem. The Official method is to uninstall Picasa and reinstall it. It is important to realize that, when you uninstall Picasa, you have the choice of deleting the database. If you say Yes – which you need to do if you have a corrupt database – you will be deleting an important part of the face recognition information. If you use Google’s Contacts (e.g. 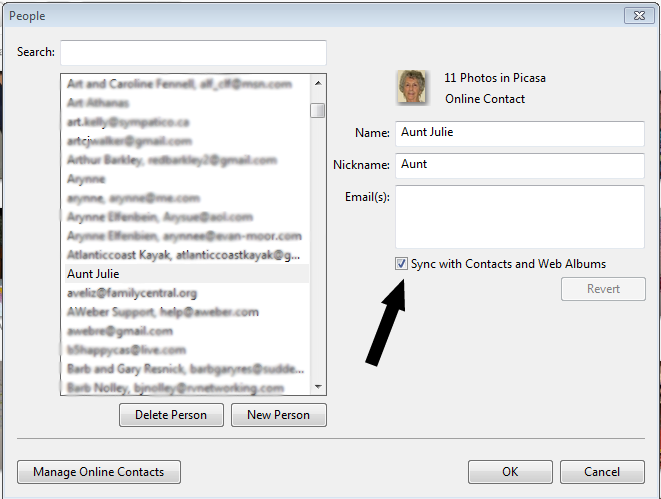 for Gmail) and you have set the option in Picasa to ‘Sync with Contacts’, then you’re all set. Picasa will be able to recreate your nametags. This setting is located on the Tools Menu, People Manager. 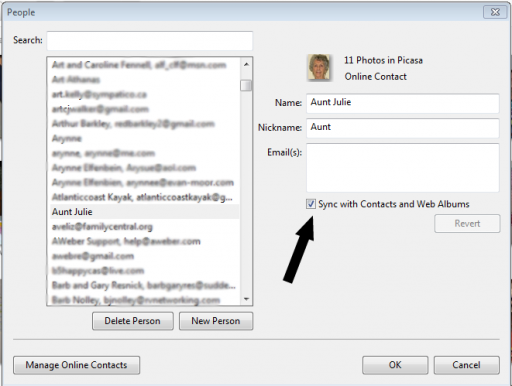 Read more about Sync’ing Name tags and Google Account contacts. If you didn’t have that set, then you’ll need a backup of a Picasa file called contacts.xml. Read on to understand why. The identity of the faces in your pictures is stored in the Contacts folder within the Picasa2 folder. It’s a file called contacts.xml. These folders are hidden – you need to turn on the ability to see hidden folders in order to see them. From Windows Explorer: Tools, Folder Options, View, Advanced Settings, Show Hidden Files, Folders or Drives. So – if you uninstall Picasa, and choose to ‘delete the database’, you will be deleting the entire Picasa2 folder, including the contacts. When you re-install it, that PIcasa2 folder and database configuration gets rebuilt. Picasa uses the information in the picasa.ini files in each folder in order to rebuild the database. EXCEPT the identification of the people. If you made a copy of your contacts.xml file before uninstalling – you can get that back by simply copying your backup and pasting it into the Picasa2 folder. The Picasa2Albums folder does not get deleted when you choose to delete the database upon Uninstalling Picasa. So, when you reinstall, your albums should come right back. I still make a backup copy of the Picasa2Albums folder just in case. Backed up the contacts.xml file, Backed up the Picasa2Albums folder. Uninstalled Picasa. I clicked on Start, All Programs and found the Picasa folder, there is an option there for ‘Uninstall Picasa.’ Be sure to say Yes to deleting the database as part of the uninstall. Remember – the reason you’re probably doing this is that the database is corrupted! Re-installed Picasa. Go to www.picasa.google.com and click the button to Download Picasa. Then choose Run to install it. Opened Picasa and let it re-scan. Choose, Scan My Pictures, My Documents, This can take a while – sometimes hours. Restored the Contacts.xml file. This is the key to getting your faces back. After step 4, I saw all 48 of my face albums listed, but each face was labeled <Unknown Person> I copied the Contacts folder that I backed up in step 1, and pasted it into the Picasa2 folder. Nothing happened immediately, but when I looked again after about 15 minutes People’s names were starting to show up. I left it alone all night and when I looked in the morning, all my faces had names. Note: my albums all came back in step 4. I didn’t have to do anything. The Picasa2Albums folder was still in the location where it had always been. It does happen. I saw it just this past week while private tutoring someone on Picasa. I double-clicked on a thumbnail photo of a little girl, and what appeared was a photo of a boat! What the …. ?!#%*! This can be a scary experience if you don’t know what’s going on. It appears that your pictures are missing or garbled. All that has actually happened is that Picasa’s listings of them have become corrupted. Your photos are fine. It’s like you’re trying to read a book with someone else’s eyeglasses. Nothing looks right, but the book is fine. What I referred to above as Picasa’s ‘listings’ is actually a database, and it needs to be rebuilt. The built in method to accomplish this is to hold down the Alt, Ctrl, and Shift key as you launch Picasa. Make sure to launch Picasa from the start menu however, not from a desktop icon. Click Yes, and it will rebuild it’s internal database. When it’s done, your pictures should all be back to normal. Where it reads ‘Chris’ above, you would substitute your user name. (thanks to a comment below for reminding me to tell you that this is a *hidden* folder. You will only see it if you have your system set to view hidden folders – Tools, Folder Options, View, Show Hidden Folders) The easiest way to make Picasa rebuild it’s database is to remove the current one,then it has no choice but to build a new one the next time it opens. I like to just rename the Picasa2 folder to something like Picasa2-backup, just in case something goes wrong, I can always return to how it was. Then I open Picasa. It will come up with the same message it displayed when you first installed it … “Do you want me to scan your entire computer, or just My Documents / My Pictures?” I choose the ‘My Documents … ” option. When it’s done with it’s scan everything should be back to normal.